Cianbro Construction prides itself on handling projects that are a bit out of the ordinary. In the past, the company has done everything from the construction of floating offshore wind turbines, to the installation of 230 miles of electrical transmission lines, to the replacement of thrusters on a massive oil drilling ship. So it should come as no surprise that, when the search was on for a contractor to erect an observation wheel near our nation’s capital, Cianbro was at the head of the list. But the logistical challenges for the project — its construction at the end of a long and narrow pier, for example — taxed even Cianbro’s impressive specialized-equipment inventory. To get the access and reach they needed for several facets of the job, the company turned to Genie which had just introduced its SX-180 boom lift with 180 feet of vertical reach. Armed with that newfound capability, the project is proceeding on pace and, despite some early weather-related challenges, the attraction should be open in time for Memorial Day 2014. The idea of an observation wheel as a tourist draw dates back to 1893 when the first wheel, designed and built by George Ferris, Jr., wowed attendees at the Chicago World’s Fair. Since that time, the scale and sophistication of observation wheels has steadily grown, with landmark structures in London (“The London Eye”), China (“Star of Nanchang”), and Singapore (“Singapore Flyer”), as well as the soon-to-open 550-foot tall “High Roller” in Las Vegas. At 175 feet, the “Capital Wheel,” as the structure Cianbro is erecting is known, will boast some of the most iconic vantage points imaginable, offering views of the White House, Capitol building, National Mall and Arlington National Cemetery. Its location, in National Harbor, a 300-acre multi-use waterfront development in Prince George's County, Maryland just south of Washington, D.C., is a large part of the reason Cianbro is heading up the project, according to Aric Dreher, the company’s project manager. Work on the Capital Wheel started with the installation of a 150-ton steel grid base structure. Fabricated by Cianbro at its Baltimore yard, the individual components for the base were sent by barge to the Potomac River site. While that ultimately proved to be the best method for transporting such material, there was a point when the decision to do so looked sketchy at best, says Dreher. 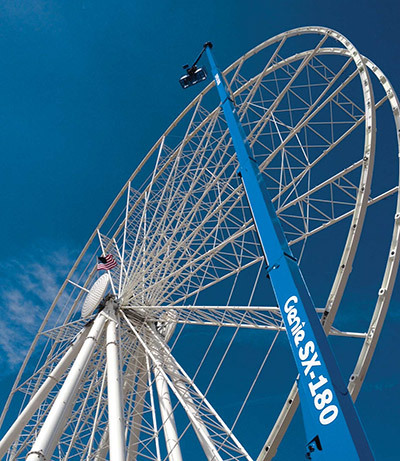 With construction of the base completed, the structure’s tower legs were erected, followed by installation of other ride components such as the axle, spokes, ring beams and lights. That pre-determined construction sequence — and being located at the end of a 600-foot pier — essentially dictated the manner in which the balance of the project could proceed. While the actual height of the tower legs and components to be assembled there could, in a normal setting, be reached using one of Cianbro’s existing standard-sized booms, access was another matter entirely, says Dreher. Cianbro’s timing could not have been better as Genie was just debuting its SX-180 boom lift, which it bills as the highest reaching self-propelled boom in its product lineup. Because of the then-limited availability of the tool, Cianbro contacted US Markets, Inc., an Elmhurst, Ill.-based equipment provider who is working closely with Genie to introduce the SX-180 into the marketplace. According to Chad Cochrane, US Markets’ general manager, they were able to deliver an SX-180 within Cianbro’s tight time frame. The Genie SX-180 was quickly loaded and delivered to the National Harbor site. Cianbro’s Dreher says its impact on the job was felt immediately. That process is aided considerably through use of the unit’s 10 foot rotating jib. Dreher says the jib and work platform are ideally sized for their needs and the articulation feature has been invaluable for maneuvering into position. Mostly to deal with weather-related delays, the schedule to erect the Capital Wheel has been very aggressive as the Cianbro team meets every challenge and every milestone on the project. Dreher says their team work and planning coupled with the performance of equipment like the Genie SX-180 boom lift, has helped get them back — and keep them — on track. Despite all the unique work Cianbro has done over the years, Dreher says there is something very special about the Capital Wheel project, given its location and the national prominence it is sure to acquire.